- Publisher Paul's letter to the Romans, says Nanos, is an example of Jewish correspondence, addressing believers in Jesus who are steeped in Jewish ways-whether of Jewish or gentile origin. Arguing against those who think Paul was an apostate from Judaism, Nanos maintains Paul's continuity with his Jewish heritage. Several key arguments here are: Those addressed in Paul's letter were still an integral part of the Roman synagogue communities. The "weak" are non- Christian Jews, while the "strong" included both Jewish and gentile converts to belief in Jesus. Paul as a practicing devout Jew insists on the rules of behavior for "the righteous gentiles." Christian subordination to authorities (Romans 13: 1-7) is intended to enforce submission to leaders of the synagogues, not Roman government officials. Paul behaves in a way to confirm the very Jewish portrait of him in Acts: going first to the synagogues. 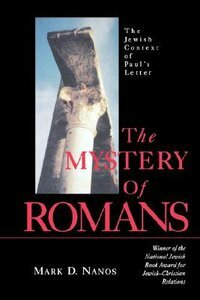 About "The Mystery of Romans"
Paul's letter to the Romans, says Nanos, is an example of Jewish correspondence, addressing believers in Jesus who are steeped in Jewish ways-whether of Jewish or gentile origin. Arguing against those who think Paul was an apostate from Judaism, Nanos maintains Paul's continuity with his Jewish heritage. Several key arguments here are: Those addressed in Paul's letter were still an integral part of the Roman synagogue communities. The "weak" are non- Christian Jews, while the "strong" included both Jewish and gentile converts to belief in Jesus. Paul as a practicing devout Jew insists on the rules of behavior for "the righteous gentiles." Christian subordination to authorities (Romans 13: 1-7) is intended to enforce submission to leaders of the synagogues, not Roman government officials. Paul behaves in a way to confirm the very Jewish portrait of him in Acts: going first to the synagogues.